Clarkson looks like he's a prime candidate for a coronary. He's really let himself go. FloridaPhil wrote: Clarkson looks like he's a prime candidate for a coronary. He's really let himself go. I thought May had aged badly in the clip I saw of him and Hammond. It’s the straggly hair, he looked like a tramp. It’s obviously his look though. 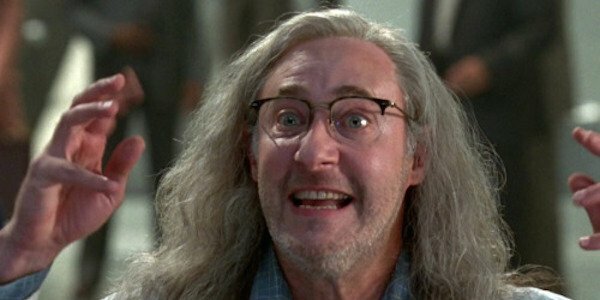 When I see May now, he reminds me of the scientist from the film Independence Day. Don't bother with episode 4, too much pratting about in pickup trucks. The trio also have a pop at Morgan and some of its non automotive products...no mention of watches! Season 3, Episode 5...the best episode yet of all the GT series, IMHO...hopefully, they will continue to work off of that formula...reminded me some of TG in its prime. Watched the first part of the Colombia special. Lame acting, stupid humor, endless bickering and no substance. They are dressed like homeless people and sad to see they aspire to humor only a 5-year old can consider entertaining. But that's just their thing and audience. I just have to watch the second part. It's like a roadside accident where you can't look away. The shooting episode in this was completely tasteless and crass. It wasn't big, or clever. But it just made me laugh; for some childish reason, I just giggled. Best laugh I've had in ages. I watched the Colombia editions and have seen half of episode 4. It’s decent lighthearted viewing. I’ve got a series record on Fifth Gear and if you just want proper car reviews then that’s more for you. I’ll keep watching both. The new Top Gear hopefully gets a balance between the two. I managed somehow, can't remember how, to watch five minutes of the machine guns on the back of pick-up trucks. Final series, five episodes (is that really a series) of Top Gear with Matt Leblanc and Chris Harris, starts this Sunday night on BBC. I watched the latest episode of GT today. A very interesting and moving tribute to Jim Clark took up a large segment of the show. My mother lives near Kilmany (in Fife) where he was born and where there is a statue of him. I knew he was a great driver he was but didn’t appreciate what an amazing record he had in many different racing formats such as touring cars. Even Fangio named Clark as the greatest ever driver.